For your mom, madre, mimi. She will love this piece!! 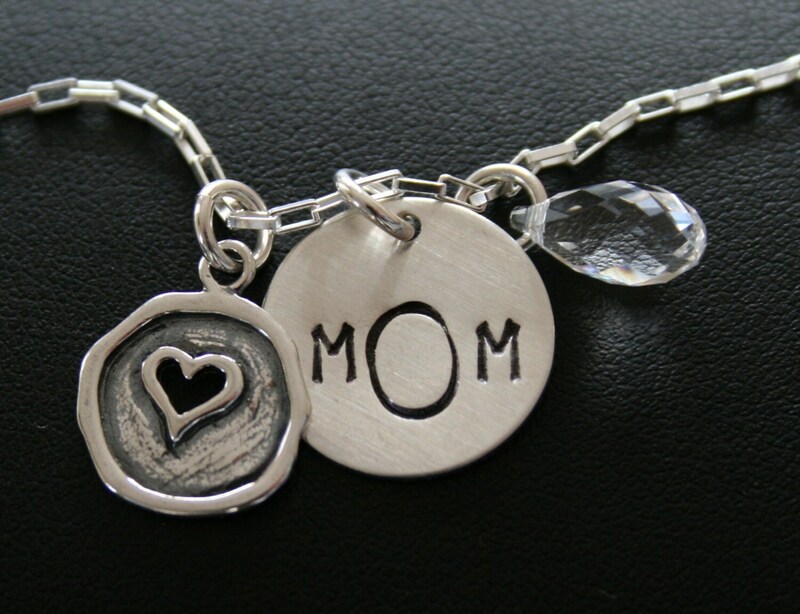 This listing is for one sterling silver disc hand stamped with Mom, mother, etc...one heart charm, and a clear teardrop Swarovski Crystal. **Want to add some sparkle/bling? Swarovski Crystals are available in birth months for $4.00 (small) or $5.00 (large). Or add a Fresh Water Pearl for $5.00. Click the Swarovski crystal listing and add as many as you need. During checkout you may specify the months. **Please make a note when checking out what you would like on the disc. Don't forget to pick your chain too! Standard chains are 18". ***Add a stick with" love" or a date on it for an additional $10.00. This necklace is shipped in a pretty organza sash for easy gift giving.